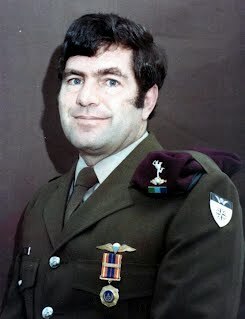 Warrant Officer 1st Class (retired) Paul J. Els, a descendant of Boer General Louis Botha, Voortrekkers Andries Potgieter and Hans Dons de Lange, was born in Empangeni, Zululand on 12 July 1944. In January 1964, after completing his schooling in Durban, he enlisted in the Signal Corps of the South African Defence Force. At the end of that year he was transferred to 5 South African Infantry Battalion in Ladysmith. He did a three month stint on the border in 1968, after which he spent a year on Gough Island as radio operator. On his return to South Africa in 1969, he became an instructor at Signal School in Voortrekkerhoogte and towards the end of that year was deployed in Africa for a few weeks. In 1972, he married Annelie. Two children were born of this marriage - Johan in 1974, and Nelie in 1976, and between them they have four daughters and a son. During 1975/1976, Paul took part in Operation Savannah and at the end of 1978, was transferred to South African Special Forces as the first long distance non-commissioned officer, radio operator and cryptographer for 5 Reconnaissance Commando. At age 35, he completed the Parachute course to qualify for his parachute wings. Having retired in 1996, he wrote: We Fear Naught but God. The popularity of the book convinced him to continue and the first was followed by Ongulumbashe: Die begin van die Bosoorlog, followed by the English version Ongulumbashe: Where the bushwar began, the revised We Fear Naught but God, then Saturday’s Soldiers - The Hunter Group, We Conquer from above, 4 SADF Operations and PARATUS.